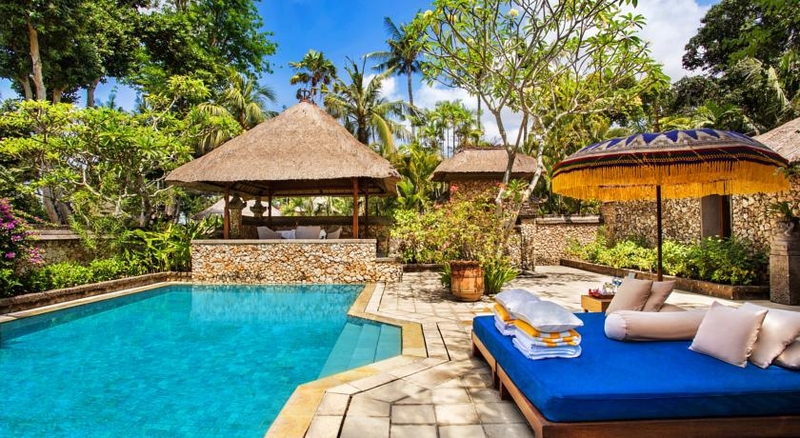 This beachside haven offers a complete Balinese experience, a secluded cluster of luxury villas in 15 acres of tropical gardens on Seminyak Beach. Thatch roof Lanai rooms each 55-60 sq.m are built in clusters of four, overlooking lush tropical gardens. Luxury Villas spread over an area of 200-250 sq.m behind stone walls. Each Villa features a lush garden with rock pond, pavilion for dining, and terrace overlooking beach or gardens. Luxury Villas with Private Pool spread over 250-400 sq.m behind high walls with swimming pool. Royal Villa Ocean View - 400 sq.m Villa has views of the Indian Ocean, swimming pool. A private terrace leads to Seminyak beach. The Frangipani Café and the Kura Kura Restaurant offer the very best in finest ingredients. The Oberoi, Bali is an ideal venue for small, intimate weddings, accommodating up to 50 guests.